"Easy access to the Temp folder of Microsoft Outlook"
Microsoft Outlook Temp Cleaner is the perfect complement tool for maintaining Microsoft Outlook. 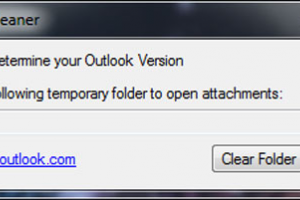 This program provides an easy access to the [Temp] folder, which is used by Microsoft Outlook to open the attachments of an e-mail. But not only that, this handy application also allows you to automate the maintenance of the [Temp] folder by using Windows Scheduled Tasks. You can determine the size of the folder, and empty it with just a single click; the maintenance of the folder can also be done through a series of commands on a CLI. The three main features of Microsoft Outlook Temp Cleaner are: ClearFolder, OpenFolder and FolderSize. ClearFolder automatically clears the Temp folder via a logon or logoff script of task, specially useful for computers in a shared domain; OpenFolder creates a single shortcut to the TempFolder, which as you know, has a different path for each individual user or account; and FolderSize allows you to schedule a task to inform you of the current size of the Temp folder, to keep track of how much space is using. A really useful program to keep your computer clean from unwanted information and hide the information you received in your mail.